Dental Erosion: The chemical dissolution of tooth structure by acidic forces without the aid of microorganisms. A fancy way of saying your teeth get soft, thin and weak if the acidic levels in your mouth become too high. The picture below is from a recent 19 year old patient who plays sports and drinks Gatorade constantly; as you can see there is a white powder look to the teeth and many pitted yellow areas. These pitted areas are actually areas where the enamel is completely gone and has exposed the soft inner portion of the tooth. Unfortunately situations like this are all too common and can be prevented if caught early. The chart below is a chart of common drinks and their associated pH values. measured on a logarithmic scale a drop of just 1 unit is actually equivalent to 10X more acid! 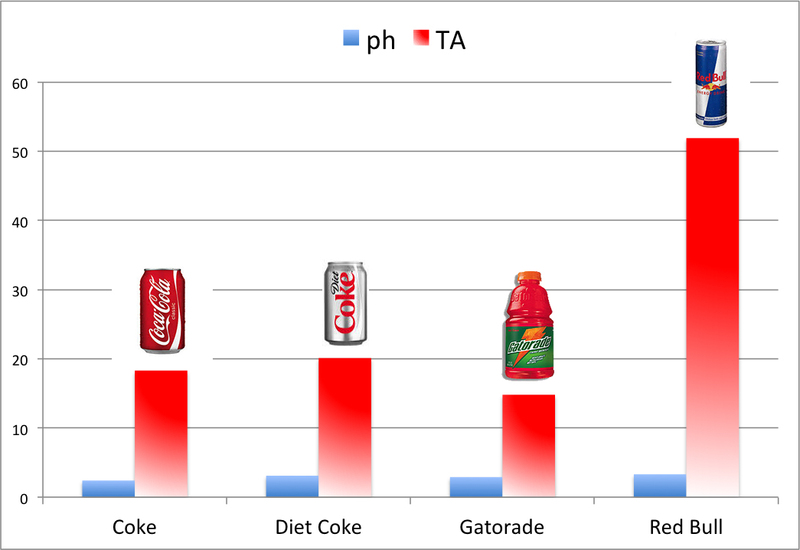 A recent study looked at a comparative breakdown of not just the acidity of a soft drink but also the acid content known as titratable acidity (TA). Taking it to the next level this study showed that even though a particular drink may have not have a lower pH level than another it could result in a significant amount of more tooth erosion. The higher the TA value the longer it will take the healthy bacteria in your mouth to go back to a neutral pH. Had a red bull lately? 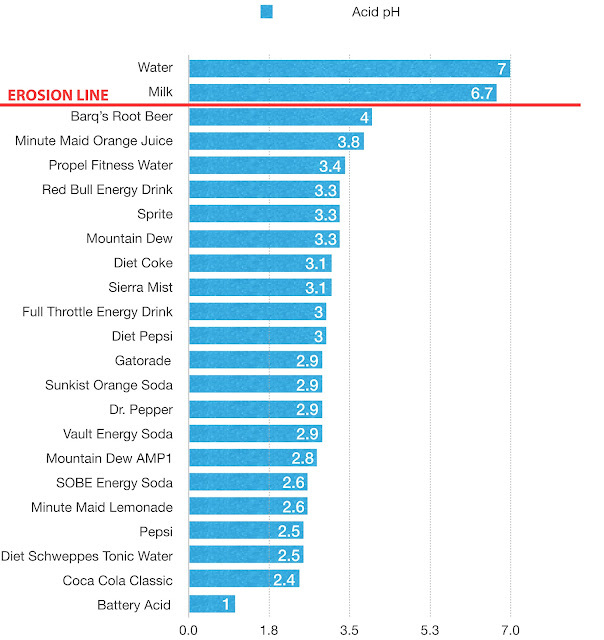 It’s likely that the high concentration of glucose and sucralose in Red Bull is responsible for the high levels of enamel dissolution found in this study. Wait at least a half hour before brushing your teeth after eating or drinking acidic things. Reason being that the acidity actually does temporarily soften your teeth and the abrasives in toothpaste can remove a small amount of enamel if you don't allow time for your saliva to remineralize the teeth. Nice post with information! if you are looking for the dental clinic this is the best dentist clinic in Chennai with reasonable price and very comfortable.